These new Vivo handsets come with a dual camera setup for selfies (20 MP + 5 MP), Qualcomm Snapdragon 652/653 processors, 4 GB RAM, all with Android 7.1.1 Nougat on top. The price tags read values equivalent to about $396 USD and $440 USD. Although Vivo is anonymous in the Western world, this top Chinese brand is very busy these days and ships an impressive number of handsets in its home market. The latest two Vivo handsets, known as X9s and X9s Plus, have been introduced quietly, but they have a few attractive feats. 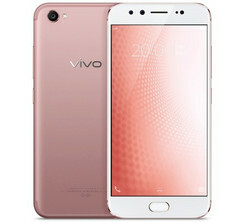 The list of common features continues with 4 GB RAM and 64 GB internal storage, a fingerprint reader, the common connectivity features like WiFi, Bluetooth, micro USB, GPS, 4G LTE. The main camera uses a 16 MP sensor with f/2.0 aperture. Both handsets run Android 7.1.1 Nougat with Funtouch OS 3.0 on top. The Vivo X9s and X9s Plus come in gray, gold, and black. The prices for the Chinese market are ¥2,698 CNY for the X9s (about $396 USD) and ¥2,998 CNY (~$440 USD) for the larger X9s Plus.